this past week was honey week in new york, a week to celebrate and share knowledge about one of the tiniest and yet most crucial members of our food system: the honeybee. there were events all over the city over the past 7ish days, but one of the agenda items i was most excited to check out (which also happened to be entirely FREE) was a tour of a local apiary (i.e. a home sweet home for bees and their hives) at the gowanus canal conservancy. this tour/chat turned out to be AMAZINGLY interesting and informative, despite the one small hiccup (getting stung, which i hadn't experienced since i was about 8 years old). one quick tip: september is the end of the season and a time of stress and lots of hard work for the bees as they stockpile honey for the winter, and because of all that stress, they tend to be a bit more aggressive at this time of year. if you want to visit when the bees are calmer, go at the start of the season in the spring. beekeeper kimberly rubin pulls frames out of a hive to show a group of girl scouts who joined us at the start of the talk. kimberly rubin, our tour guide and the conservancy's resident volunteer beekeeper, was an absolute delight. incredibly knowledgable, she was able to answer question after question from our small group of interested amateurs (literally, a full 30 minutes of nothing but questions after a 30-minute tour) all while checking on the health of her bees and hives, showing us everything from queens to drones to fresh honey to developing bees, giving us the basics on big issues like colony collapse disorder and parasitic mites, and guiding some rather hesitant girl scouts through their first up close and personal peek inside a hive. there's way too much to discuss and learn about bees to list it all (or anything near it) here. but suffice it to say, they're pollinators of flowers, foods, and basically just thousands and thousands of plants that we as humans take totally for granted, but which we really wouldn't know how to live without. they're essential members of a healthy and functioning ecosystem -- so next time you see a bee, don't swat! it might be a male drone anyway (meaning it doesn't even have a stinger; the lady bees really do run the show). calmly walk away, get behind a large tree or bush (it'll lose sight of you pretty quickly), and let it do its thing (because it's really helping you out, too). 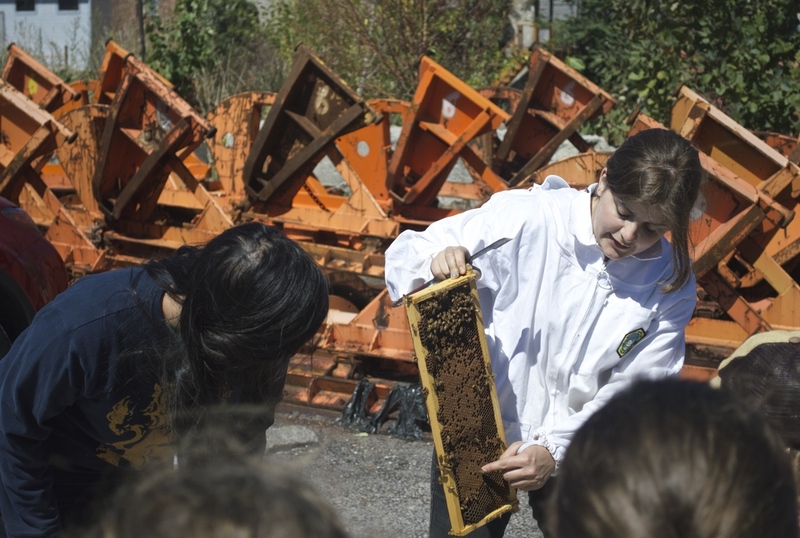 beekeeper kimberly rubin pulls frames out of a hive to show to the group. an individual frame (just one rectangular slat) up close. this particular frame has a good example of brood capping, which is the waxy golden buildup covering some parts of the comb containing immature, developing bees. and this is what a frame full of honey looks like! 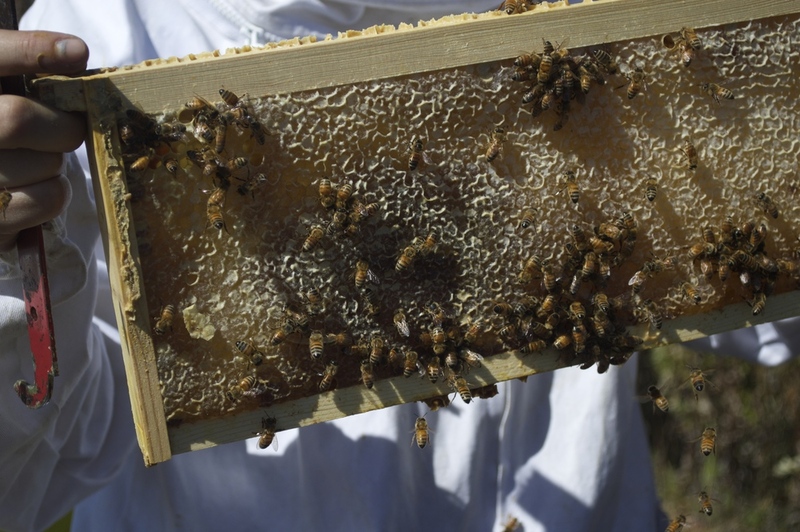 it can take bees anywhere from one week to one month to fill a frame like this one completely with honey and cap it with a protective barrier of wax.